Hardcover, 7 x 9.25 in. / 272 pgs / 4 color / 131 bw. By Daniel Spoerri, Robert Filliou, Emmett Williams, Dieter Roth, Roland Topor. Introduction by Alastair Brotchie, Malcolm Green. Illustrated by Roland Topor. 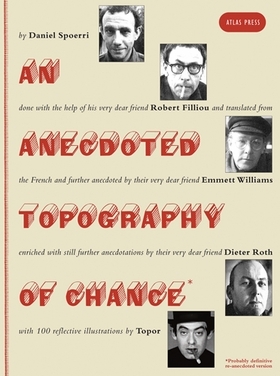 Originally published by Something Else Press in 1966 and now acknowledged as one of the most important and entertaining artists’ books of the postwar period, An Anecdoted Topography of Chance is a unique collaborative work by four artists associated with the Fluxus and Nouveau Réalisme movements, here released in a new edition. Following a rambling conversation with his friend Robert Filliou, Daniel Spoerri one day mapped the objects lying at random on the table in his room, adding a rigorously scientific description of each. These objects subsequently evoked associations, memories and anecdotes from both the original author and his friends Filliou, Emmett Williams, Dieter Roth and Roland Topor. Many of the principal participants of Fluxus also make an appearance (texts by Higgins, Jouffroy, Kaprow, Restany and Tinguely are included, among others). An Anecdoted Topography of Chance is an archaeological game, a poem to the arbitrary, an encyclopaedia, and above all else, a celebration of friendship and creativity. The Topography personifies and predates the spirit of Fluxus and constitutes one of the strangest and most compelling insights into the artist’s life. From the banal detritus of the everyday a virtual autobiography emerges, of four perceptive, witty and exceptionally congenial artists. FORMAT: Hbk, 7 x 9.25 in. / 272 pgs / 4 color / 131 b&w.